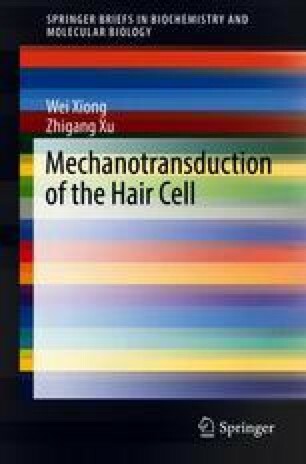 Hair-cell mechanotransduction (MET) plays so important a role in auditory sensation that its malfunction introduces severe hearing impairment. In this chapter, we listed all of the known genes linked to MET functionality, which was collectively learned from studies on mouse models and human genetics. It might give us implication in how the hearing disorder happens due to MET defect. Based on this knowledge, we would like to discuss some physiological significance of MET and potential therapeutics to treat hearing loss. Booth, K.T., et al. 2017. Variants in CIB2 cause DFNB48 and not USH1J. Clinical Genetics. https://doi.org/10.1111/cge.13170.